Growing geraniums from seed used to take a back seat to propagation from cuttings. In the past, most nursery-grown plants came from cuttings. But that has changed with advances in plant breeding. Now we can choose from excellent seed-grown varieties that outperform many older cutting-grown varieties. I’ve grown geraniums from seed, and was really happy with the beautiful and vigorous plants I got, which were several colors in the popular ‘Orbit’ series. Many seed companies offer excellent Geranium hybrids. Try Thompson & Morgan’s ‘Black Velvet’ series with unique dark leaves. Vesey’s Seeds carries the early-flowering ‘Ringo 2000’ series. Stokes offers ‘Orbit’, which has intense leaf zone patterns, and is available in a variety of colors. Also from Stokes is the excellent early-flowering ‘Elite’ series, and ‘Bulleye’ with good dark foliage that holds up in bright sun conditions. All of the hybrids mentioned here are available in a variety of colors. 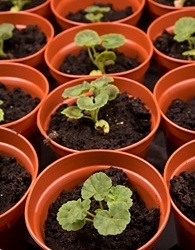 Geraniums are slow from seed, so start them early – in mid- to late January. Your plants will begin blooming about 12 to 16 weeks after sowing. The seeds have a tough outer coats, so to increase germination rates, it helps to moisten them before sowing. Dampen several paper towels. Spread seeds over half the surface, and fold other half over top. Put damp folded paper towels and seeds into a plastic zip-lock bag to keep moist. After 24 hours, the seeds should have started to germinate. For sowing, use a commercial growing mix. To avoid fungal disease (damping-off), make sure your containers are clean and have drainage holes. If you like to reuse two-and-a-half inch nursery pots like I do, wash them in soapy water, and disinfect in a rinse containing a little bleach (one part chlorine bleach to nine parts water). Moisten growing mix in a big container. Add just enough water to get the mix damp as a sponge, but avoid letting it get sopping wet. Let stand for an hour or two to absorb moisture. Label pots and put them in a plastic bag closed with a twist tie. (Or if you’ve bought cell packs and growing flats, set the plastic cover in place.). Geranium seeds don’t need light to germinate. Give them a warm spot between 70 and 75°F (21 to 24°C). I’ve put them on top of my refrigerator, and that works well. When you notice green sprouts, open the plastic cover to allow air circulation, but don’t remove it entirely. Make sure your seedlings have good light. Once two true leaves appear(the first leaves are seed leaves), remove covers. Let them grow a week or two before transplanting seedlings into individual pots. Be sure to keep the soil mix moist – but not soggy. Watering from the bottom is ideal. Set the pots into a shallow tray with water, and remove them when the top is moist. Grow your seedlings on a window sill with good sunlight – south-facing is ideal – or set them under fluorescent lights with the lights on for 12 to 14 hours daily. This is easy with a timer. Once a week, feed with a water-soluble fertilizer diluted to half-strength. Once the plants are growing strongly, pinch off the tops to keep plants compact and promote branching. For information about when and how to take your plants outdoors, see seedling care and hardening off. Geraniums from seed are usually single-flowered. Their flowers tend to shatter when blooming is finished, which means not as much deadheading for you. Seed grown types are available in a wide range of colors: soft pink, hot pink, pure white, pink-and-white, lavender, red, scarlet, scarlet-and-white, orange-salmon and coral. 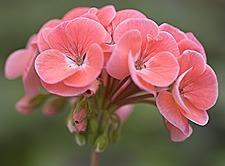 Cutting-grown geraniums can have single, semi-double or fully double flowers. If the florets don’t fall apart when bloom is over, it is most likely cutting-grown plant. Deadhead these plants to keep them presentable and to reduce fungal disease problems. Many zonal and ivy types, regal geraniums (Martha Washington types) and scented-leafed varieties are grown from cuttings. You can take cuttings of your seed-grown plants if you want to keep them going another season.